Wet Feet or Dry Feet? There seems to be an endless supply of bizarre legal questions involving jurisdiction and outer space. 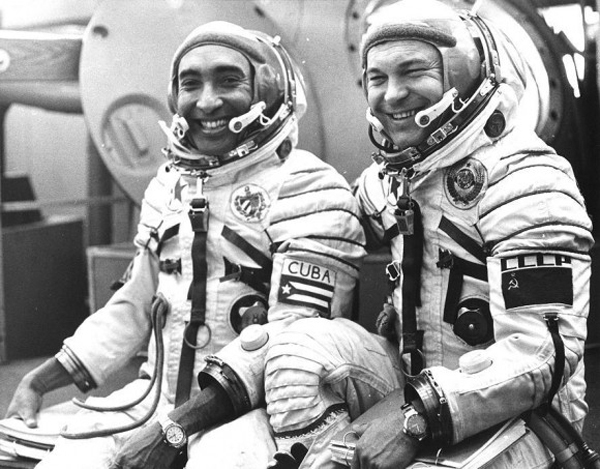 Here's a particularly William Gibson-esque scenario: The world's first Cuban cosmonaut, Arnaldo Tamayo Méndez, launched into orbit in 1980 aboard Soyuz 38. The U.S. had no functional, manned spaceships in 1980... but imagine it had. What if Cosmonaut Méndez had donned a jet pack and flew from the Soyuz over to an American spaceship? On arrival, could he have claimed asylum in the United States under the "wet feet, dry feet" policy? The crew of Soyuz 38, pre-launch. Here's what I mean by "wet feet, dry feet": apparently Cubans seeking asylum in the United States are treated differently than other nationalities under U.S. immigration law. It seems they are generally eligible to apply for asylum by virtue of the fact that they are Cuban; there is no need to provide detailed documentation of persecution. But, the Cuban must reach the United States before claiming asylum. Under a 1992 Executive Order, Cubans intercepted on boats en route to the United States are repatriated. But under federal law (8 U.S.C. § 1225), a Cuban who "arrives in the United States" can apply for asylum. So a Cuban who makes it to shore in the U.S. (or arrives at the U.S. border) can apply for asylum. What counts as arriving in the United States? Under the 1967 Outer Space Treaty, Article VII, countries have jurisdiction over the objects they launch into space. The United States has ratified this treaty. Would Cosmonaut Méndez, safely aboard Skylab or a Space Shuttle, have "arrived in the United States" within the meaning of federal law? 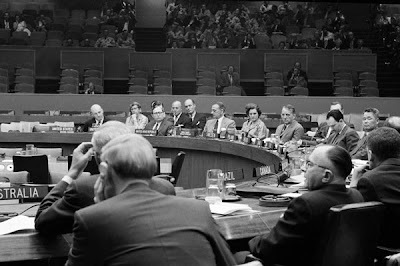 Negotiating the 1967 Outer Space Treaty. Of course, I haven't seen any evidence that Cosmonaut Méndez would have been remotely interested in testing this legal theory. Soyuz 38 landed safely in Kazakhstan after a little over seven days in orbit. 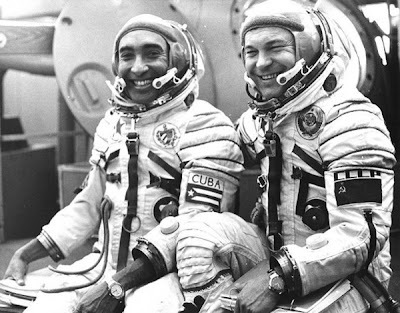 Cosmonaut Méndez is now a retired Brigadier General, still living in Cuba. 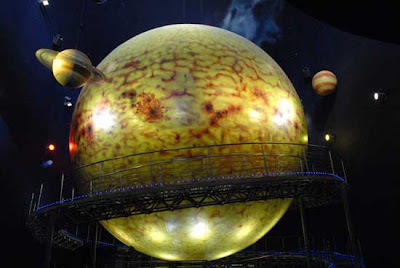 In 2011, the newly opened Havana Planetarium held an event in his honor, celebrating the 30th anniversary of the historic flight. But based on a 2006 federal court decision, we have some idea of how this bizarre hypothetical would play out. In 2006, 15 Cuban refugees (including two children) made the perilous sea voyage from Cuba to the Florida Keys, landing on an abandoned bridge before being discovered by the U.S. Coast Guard. 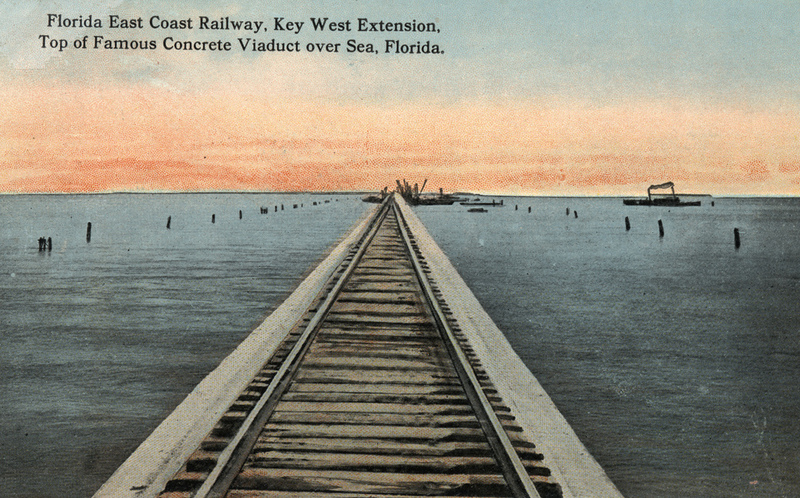 Seven Mile Bridge no longer fully linked to land, though it was still owned by a Florida state agency. The Coast Guard claimed that the Cubans had "wet feet" since the bridge was an "artificial structure without its own territorial sea." The Coast Guard supported its position with a 1907 court decision that defined landing in the U.S. as coming to the shore from a boat. 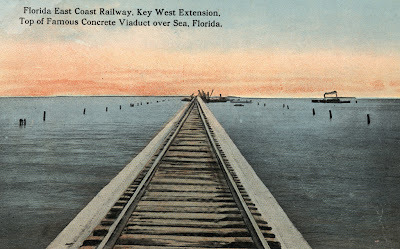 But when the case was appealed to federal court the judge decided differently: arriving at Seven Mile Bridge counted as arriving in the United States; the Cubans were eligible for visas. * The judge noted that the U.S. Coast Guard's website even states that reaching rocks or bridges or piers suffices; just because a bridge is not connected to land did not mean it is not the United States. 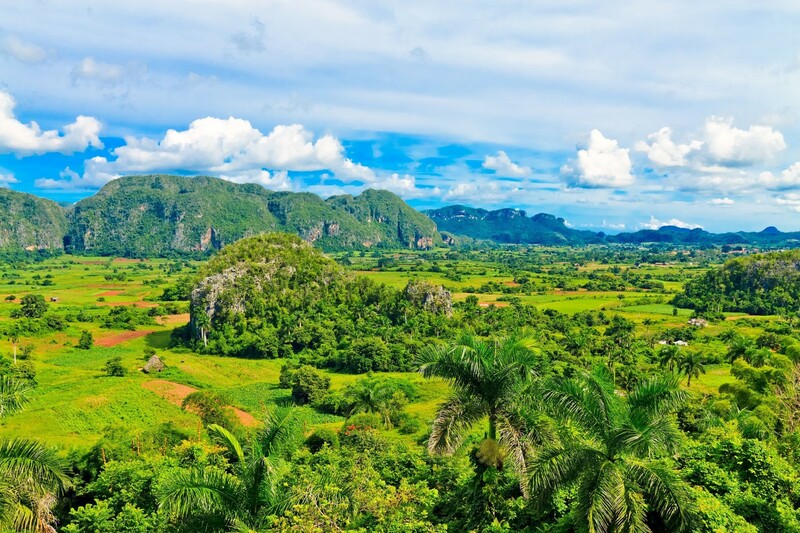 Fourteen of the fifteen Cubans chose to apply for asylum. For them, an extremely difficult journey has hopefully had a happy ending. 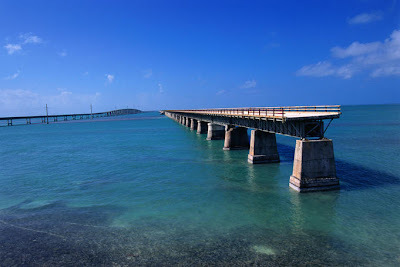 Seven Mile Bridge, back when it was new. Source: Friends of Old Seven. * = The judge added a bizarre footnote to the decision: if you've seen the Arnold Schwarzenegger film True Lies, you've Seven Mile Bridge get blown up! Apparently the movie producers rebuilt the missing part, reconnecting it to land, just so they could blow it up for the movie(!) 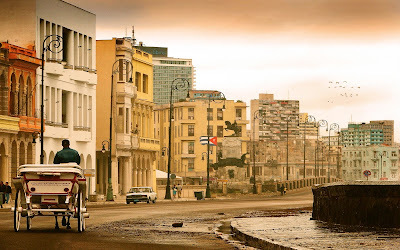 So for a few weeks in 1993, Cubans could have landed on the bridge and applied for asylum without any legal dispute. 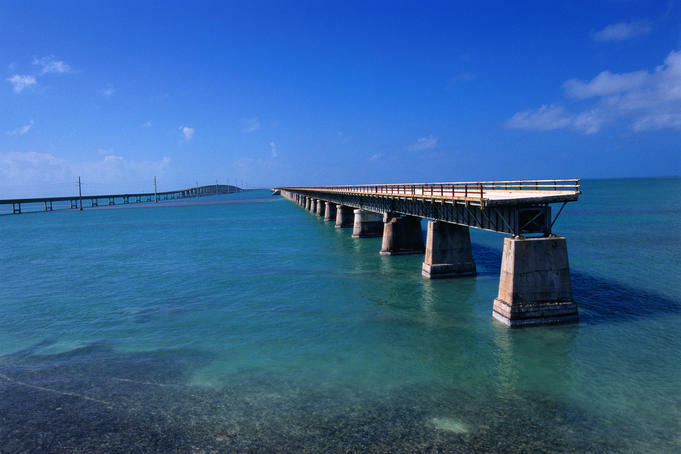 While it presents an interesting set of facts, the Seven Mile Bridge case is sobering, isn't it? It's terribly frightening to imagine being one of the fifteen people on that bridge. At best, you are starting over in a new country where you don't speak the language, don't have a job, don't know anyone. You many not get see your family and friends back home again for years, or decades, or ever. At worst, you could be sent home, facing danger, and having spent all your savings, risked your life, and endured God knows what to reach the United States. Sources: This compelling news story describes the plight of a few relatively fortunate Cuban asylum seekers, giving a human dimension to a political issue. Additionally, I drew on 8 USC § 1225; Latinamericanstudies.org; Movimiento Democracia, Inc. v. Chertoff, 417 F. Supp. 2d 1343, 1344 (S.D. Fla. 2006); Executive Order 12807 (1992); the 1967 Outer Space Treaty; and Wikipedia. Disclaimer: This blog does not constitute legal advice, or form an attorney-client relationship.